Marbled cheese in the shape of Texas. This is a hoot. 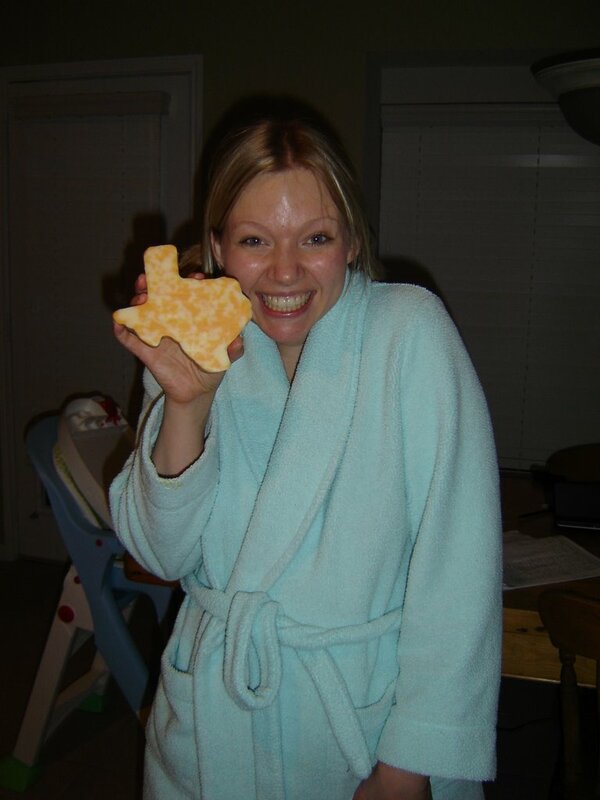 I love trying cheese that is indicative of the region - and I didn’t think Texas has any to brag of. But I did tell you that whatever you want, you could get here in Texas? As you can see, there are even things that you probably wouldn’t want (not huge fan of marbled cheese, it is the Kestrel, or Budweiser for those on this side of the pond, of the cheese empire). Nothing stinky here I am afraid. Fetch hither le fromage de la Texas! M-mmm! Stay tuned for other tasty Texan tidbits. "Shrimp are the fruit of the sea"
We are finally back home on the range, having spent nearly a month back up in Canada. Valerie and Tim were married on July 28. Wedding was gorgeous! Congratulations to you both! It was certainly a nice ceremony and reception. I'll stick in a few pics so you can see how beautiful the bride was (you were pretty too Tim!). Marcus and I would like to think of it as our wedding really. We were so preoccupied with wedding preparations last year, it was nice to chat up relatives and friends we missed during the last round of nuptial celebrations. It was lovely being back in Newfoundland for a "vacation". We have been so busy these past four months with moving, that it was nice to finally wake up and say "I have NOTHING to do today!" Well, theoretically. There is always something to do when there is a wedding on the horizon. I would have liked to visited more friends whilst I was there, but it was a bit of a circus with friends and family flying in and some party or gathering every night. And if you know Keith and Elaine (aka Mom and Dad), you know that life moves pretty swift and you are only allowed to sleep when you are dead. So needless to say, three weeks felt very brief indeed. Emma is great. She will be 5 months old tomorrow. When I arrived back from Canada I started putting her in her highchair. We have been practicing sitting by doing "row, row, row your boat" on the floor about a million times a day, and we get her to practice sitting supported by us whilst we sit crosslegged on the floor. Seeing how strong she was in her highchair, I placed her on the floor on her blanket and sure enough, she can sit up unaided for a considerable length of time. This morning I timed it. 9 min. she spent playing with a ball, sat bolt upright. When she finally fell, she fell backwards and put her hands back to stable herself and she lowered herself down gently. When did she learn this? Incredible. Anyhow, to those of you who don't have kids, your eyes have glazed over by now, but we are seriously impressed by this. She turns 5 months old tomorrow and she is already sitting up unaided. Pretty cool. I am teaching her the Periodic table of elements next week. 9. No, you don't understand, REALLY Hot! numbers 1, 6, 9, and 10 are things that we take very much for granted in Canada. Very very important things. Anyhow, without going on too much about that, I will say that we are really enjoying it here. I guess we are still in our Honeymoon phase of the move, where everything is curiously different and cool. Marcus has BBCAmerica on the tele, and that makes all the difference. I miss my CBC, but I listen to the radio via the web, so Sounds Like Canada is still the morning staple. This weekend we cooked Giant Texan shrimp. You know that phrase "throw some shrimp on the 'barbie"? Well, this is precisely the type you would use. If I were swimming in the ocean and saw one of these suckers, I would probably lose my noodle. So, I guess, in keeping with my observations, they were like much of Texas is, VERY BIG. But by the time I cut the heads off and the legs, deveined (blech! ), and deshelled (what seemed like whole days off my life) then threw them on the "barbie", they curled up quite small and resembled the large frozen tiger shrimp you get prepackaged at Dominion. So basically lots of work for something I could have picked up in the frozen food aisle. Lesson learned. Anyhow, it was fun to do Bubba and Forest Gump impressions for a bit. Well, going to go about my day in the land of the free-to-carry-firearms. Stay tuned on developmental progress of Emma - who I bet you any money, will be crawling by the end of the month.